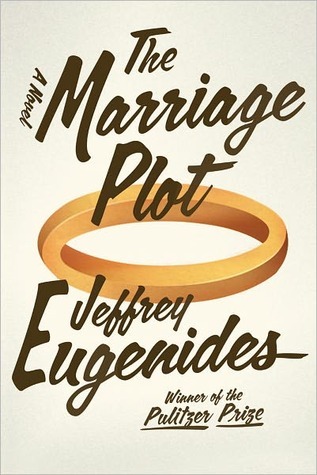 Last week I breezed through Jeffrey Eugenides' The Marriage Plot. I'm not quite sure if I read it so quickly because I've been working through some heavy duty non-fiction (ie the gigantic biography of Frank Lloyd Wright) or because it was fun to read, but either way, this book was a quick read in the best sense of the word. The story finds the protagonist Madeleine as she finishes up her senior year at Brown, in the early 80's venturing into the strange world of a new relationship in the uncertain year following graduation. Though I didn't go to Brown in 1982, and I've never spent much time on the east coast - this book perfectly encapsulates what it is to be in the post-grad-funk when the question on everyone's mind is always "What do I do now?" I related to this character in a number of ways, from her academic interest in something so specific, the marriage plot in Victorian literature, to experiencing the strange phenomenon of being in a new relationship, while at the same time figuring out which of her skills and interests are marketable in the sense of the uncertain job market. The book follows Madeleine, her new beau Leonard, and her close friend Mitchell on their journey from the graduation podium and beyond. Mitchell, a religious studies major, fulfills the post-graduate stereotype of finding himself while traveling around the world always chanting a familiar mantra in his head, "Lord Jesus Christ, Son of God, have mercy on me, the sinner," not in the religious sense, but merely regurgitating the words of the misguided fictional Franny Glass. Maddy and Leonard move to the Cape together, and without spoiling much, end up in a bit of a bind, regarding, you guessed it, the marriage plot. While things do get chaotic, the book resolves quickly - similarly though not with as much tact or grace as J.D. Salinger's books neatly tie themselves together. There are a few loose ends, but not many. And though the book seems to be about "nothing" in the end, the journey is where the story lies. I'll give this book a B+ because it was fun, and meaningful to me - the epitome of a misguided post-grad with who is constantly wondering if she is "living up to her potential". I say, if you're going to read something by Eugenides, go with Middlesex. The story from start to finish is much more enriching and entirely more satisfying! Or, if you'd like to see the journey of a just as frazzled post-grad, why not cut out the middleman and read Franny and Zooey, one of my all-time favorites! That is a pretty concise synopsis of that book mate! Do you do book reviews for a living? I guess you should! You are really good at it. I wish I could say I write book reviews for a living - but that'd be a stretch from the truth. I work at an art museum in Chicago, and one of my hobbies is writing book and film reviews. If you're interested in seeing some of my other writing, feel free to peruse my list. PS I'm always curious as to how people find my blog. Care to enlighten me?